Isn't this just as cute as it can be? 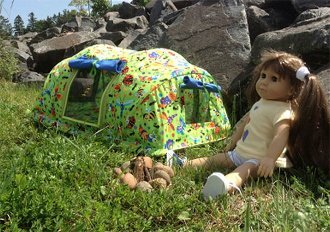 Your 18" doll will love camping with you in the backwoods OR your bedroom in this clever free-standing tent. Self-supporting, this tent really does stand up until you decide to take it down. Screen windows on each end have coordinating window flaps that roll up and tie out of the way. The zippered screen door also has a roll up flap - AND you can roll up the screen also and tie that out of the way. This tent is just about as adorable as they come and "sleeps" two 18" dolls. 15" X 27" X 12"